Touch typing is an important skill that students need to be taught at an early age. Previously I have blogged four free online sites but I have recently discovered another two. These sites are great because the key board is displayed on the monitor. This may reduce students looking down at their key board in order to locate the keys. Some teachers suggest using skins (plastic covers) to cover the keys so students can’t look down at the keys. I haven’t tried this but I think it is a good idea. 1. Text type 2 has three activities to choose from. Students can text type with 28 lessons choice, practice letters on the keyboard with speech or text type with speech. 2. 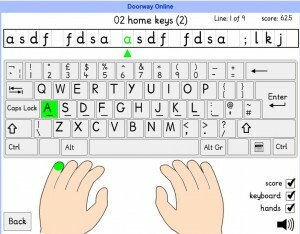 Keybr.com allows students to practice typing letters and records their speed and accuracy. My favourite program is still Typing Tournament but this does cost money. Information Source: Ashley Jenson (Pinterest) who pinned King School Library’s blog post.